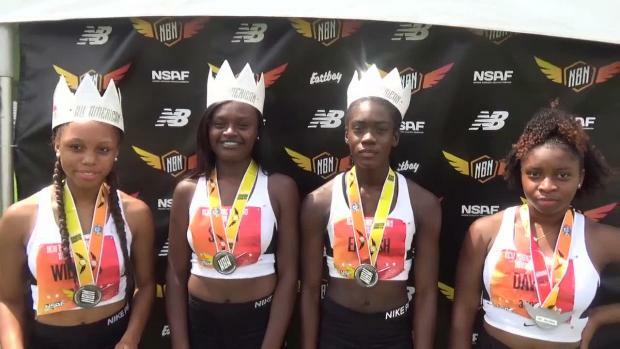 The NBON Championships are this weekend, and the country will descend on North Carolina. 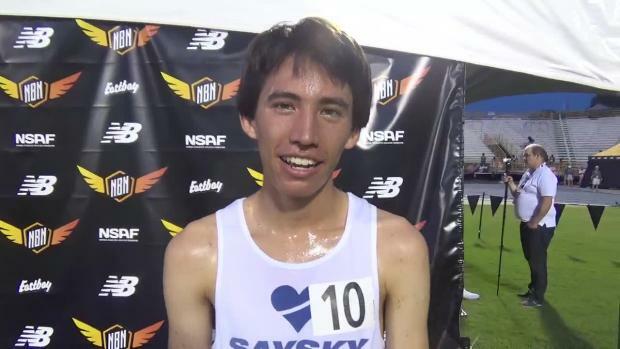 See who will toe the line starting Friday morning. 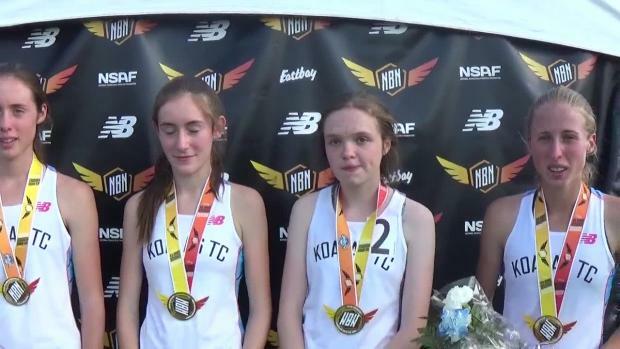 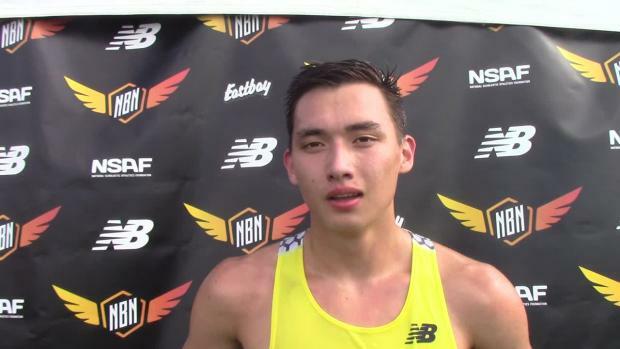 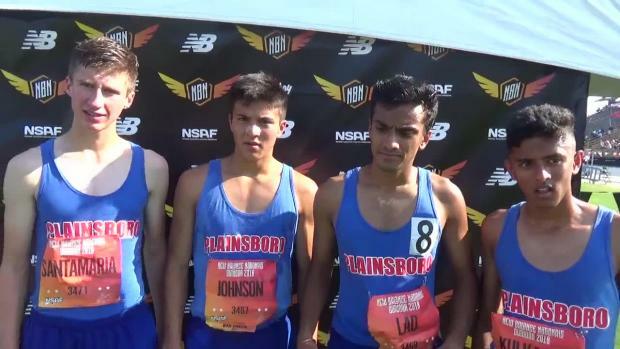 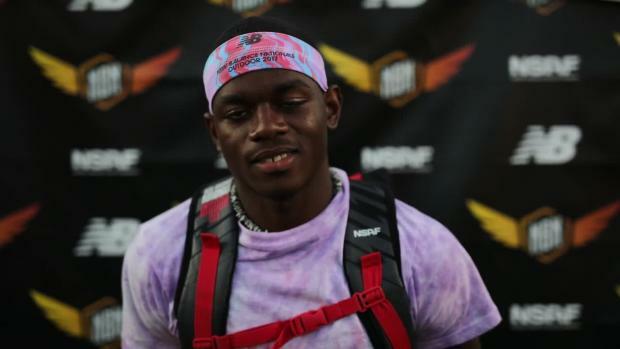 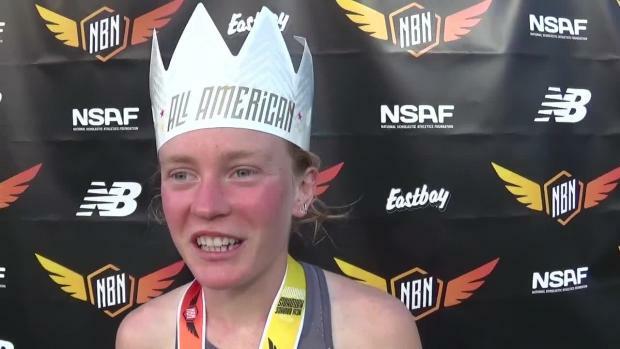 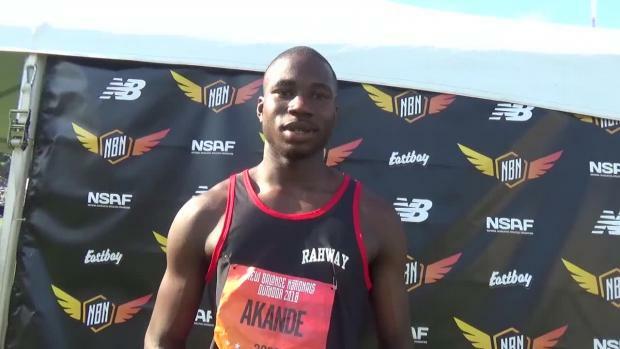 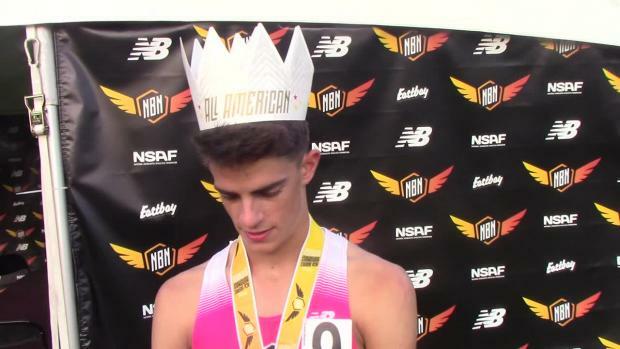 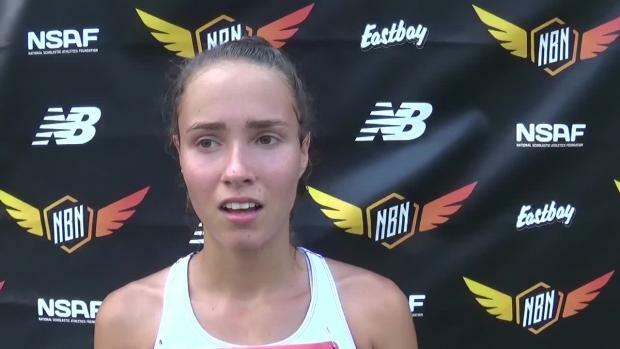 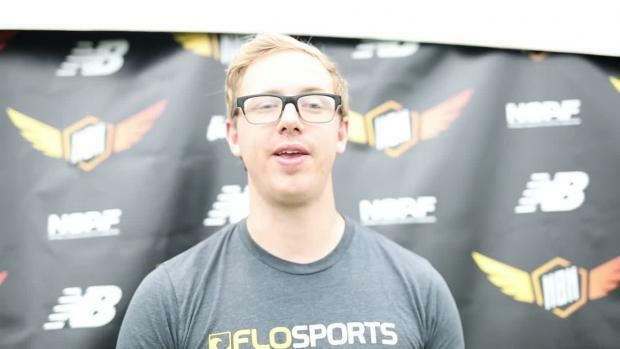 Selected highlights from New Balance Outdoor Nationals. 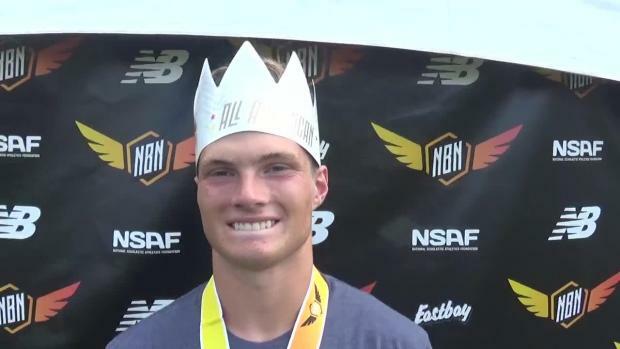 Looking through the entries, the Bay State has the potential for quite a few of its' athletes making the podium. 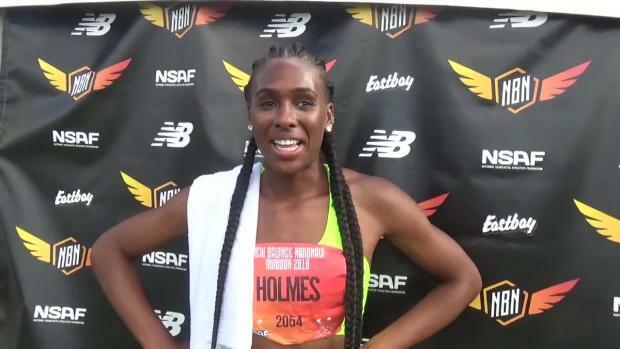 Here's a look at our top contingent that's heading to the New Balance Nationals Outdoor Championships. 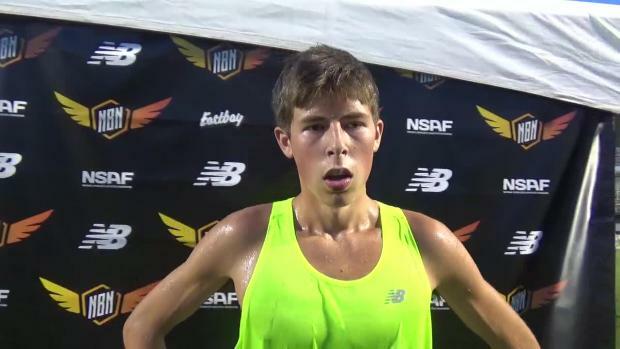 Check out the 26,000 plus photos from New Balance Nationals sorted by event right here. 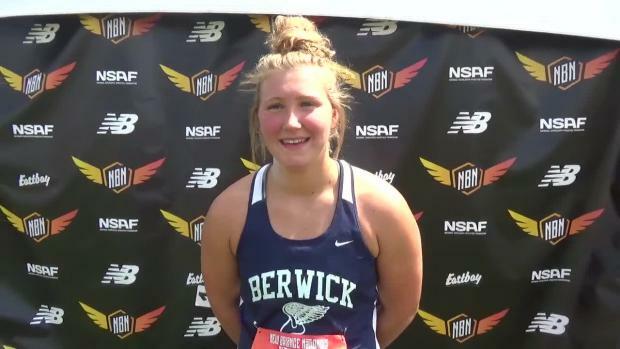 East Greenwich finishes third overall in the Championship race, break R.I. mark by more than two seconds! 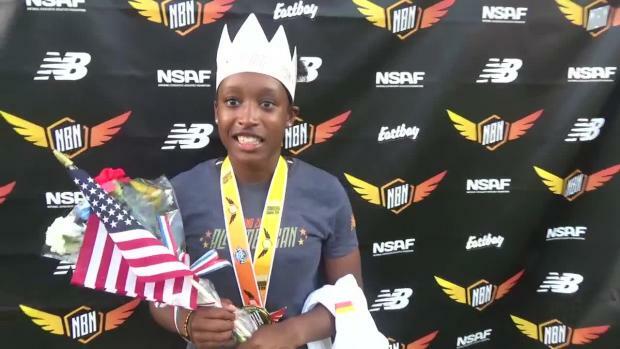 The IMG Academy standout adds a national title to her resume that includes a 5th place showing at last year's World Youth Championships in Kenya. 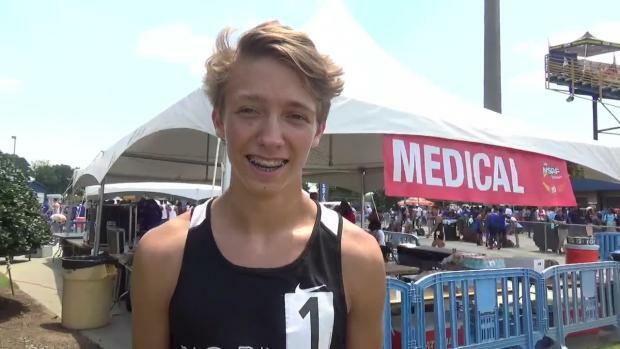 Who from North Carolina is heading to Greensboro for Nationals this weekend? 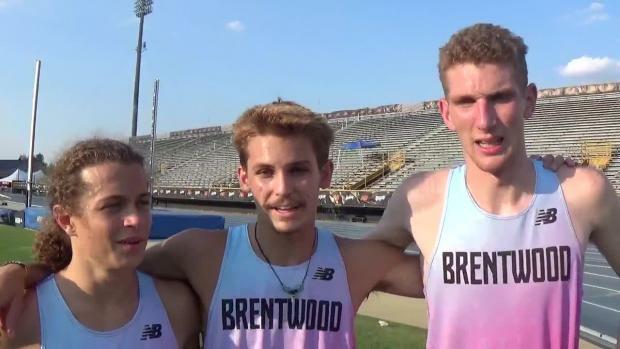 The Bruins of Western Branch made it one for the history books and sent King Touks out in style. 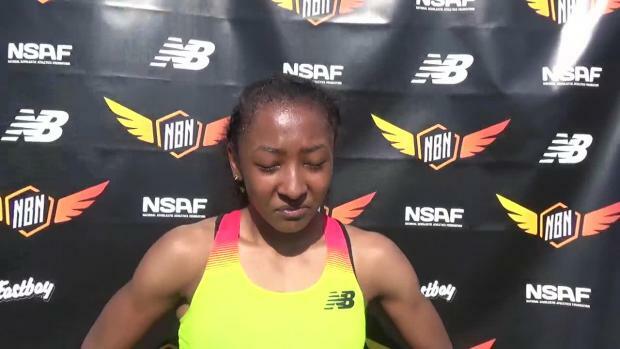 Check out the athletes entered in next weekend's New Balance Nationals Outdoor! 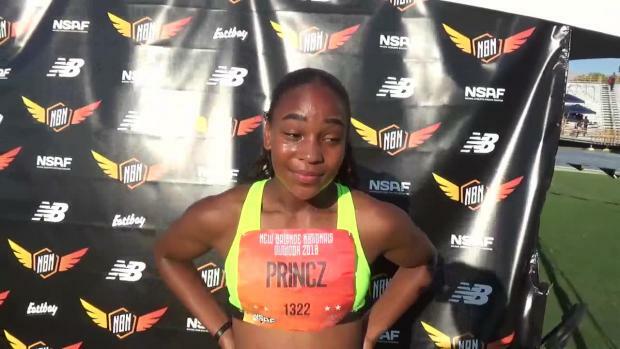 The updated (as of 6/11) entries for NBNO are here! 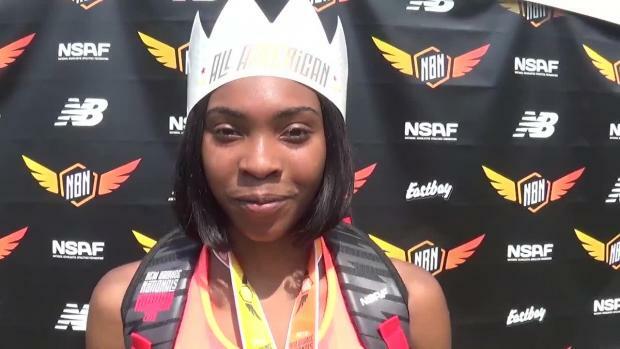 Today she went from being a star to being one of the greatest ever in VA track history. 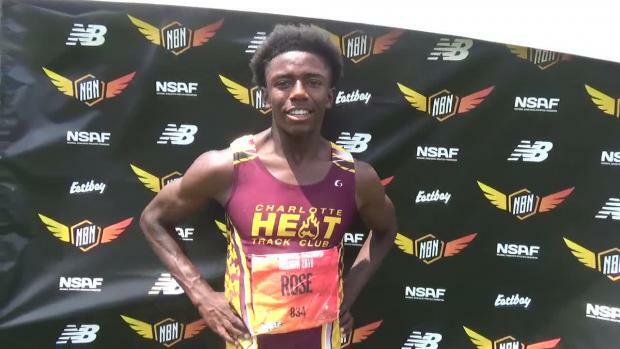 The heat sheets for NBNO are here! 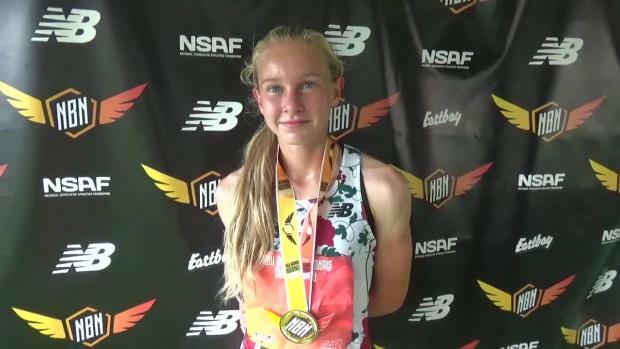 Here are the entered Virginia athletes and teams in the New Balance Outdoor National Championships. 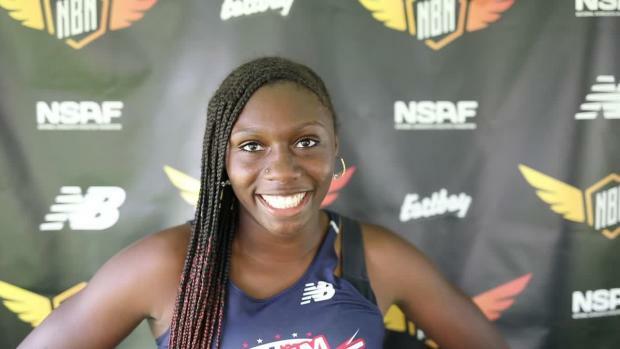 Thomas Dale graduate and Georgia commit, Titiana Marsh, made the most of her final high school competition in the triple jump. 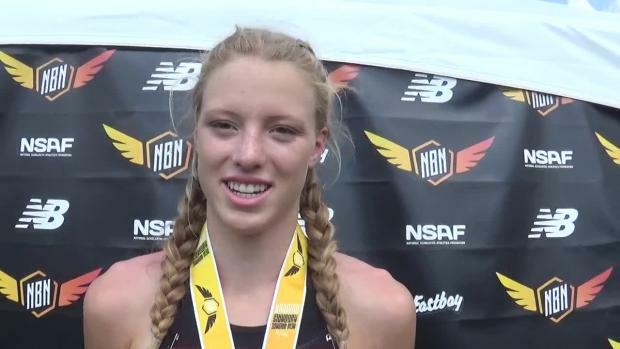 Your place for updated from New Balance Nationals. 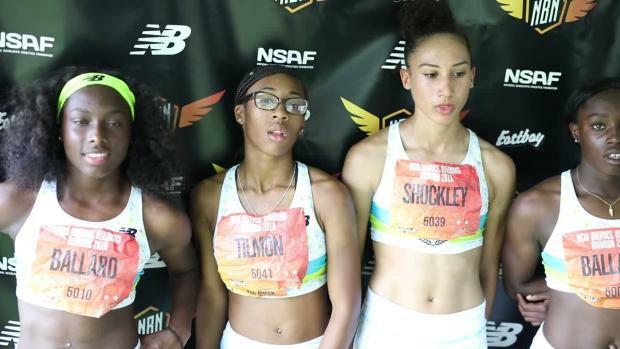 The team of Shadajah Ballard, Jazmine Tilmon, Adriana Shockley, and Na'Taja Ballard not only won their third national title of the weekend but they also set a new national record for the shuttle hurdle relay. 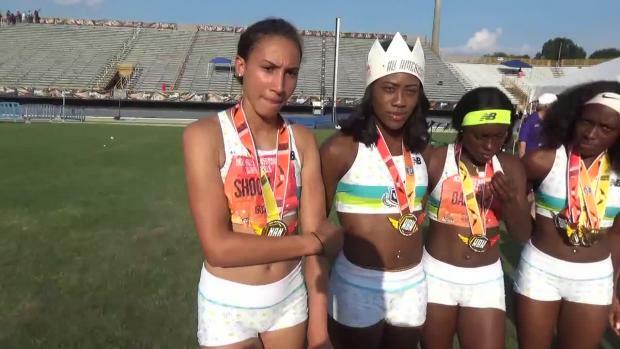 Who from Florida is heading to Greensboro, North Carolina for Nationals this weekend? 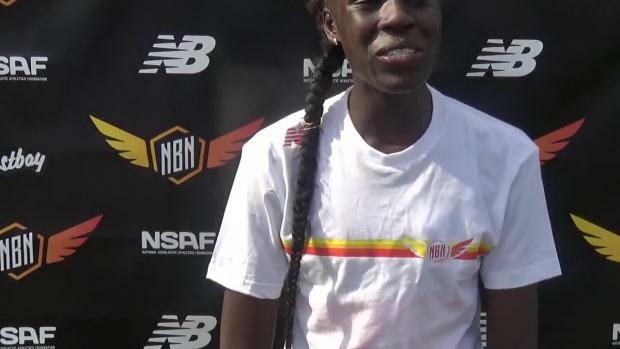 Sophomores Athing Mu and Victoria Vanriele placed their names among New Jersey all-time greats on Sunday at NBNO. 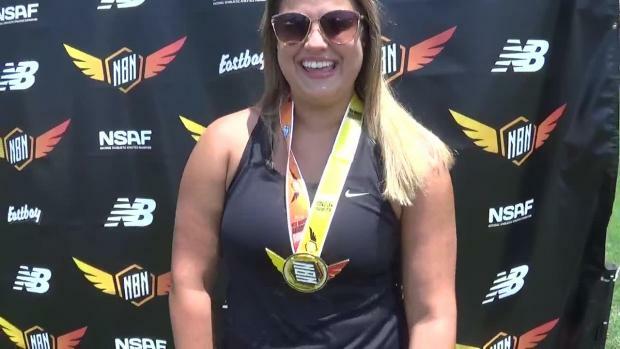 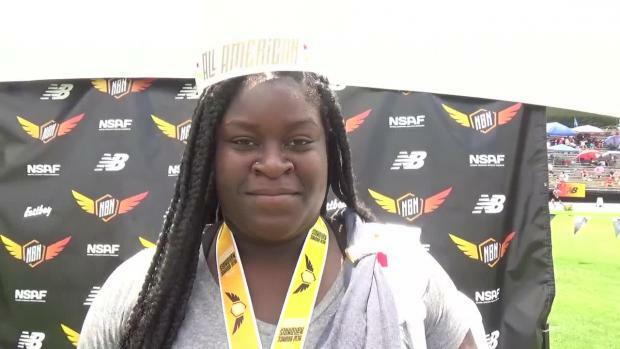 Veronica Fraley is now a National Champion in the Discus! 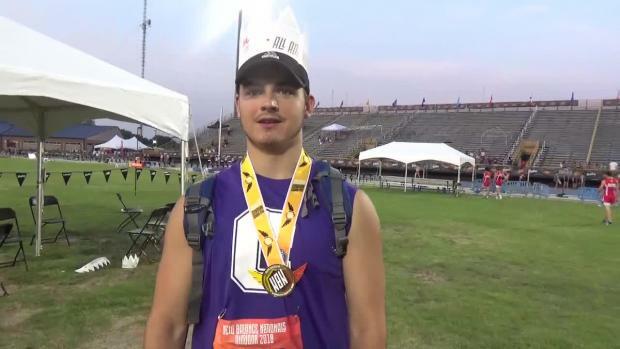 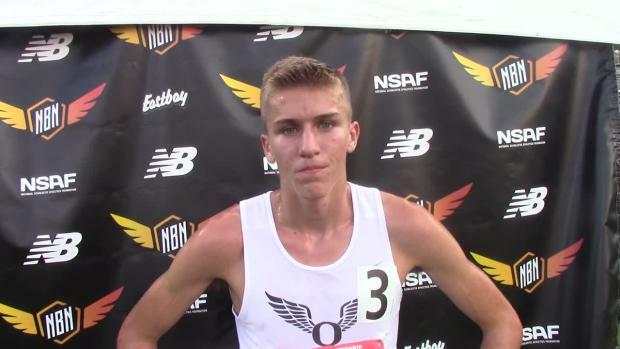 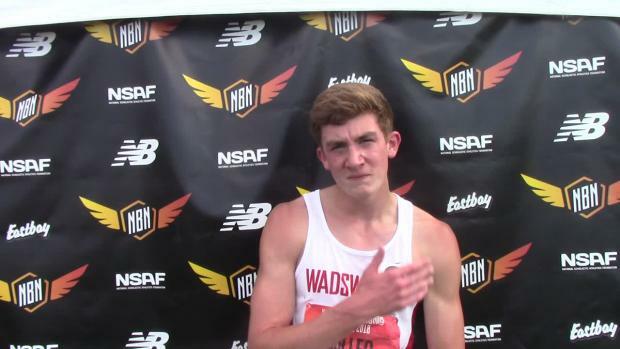 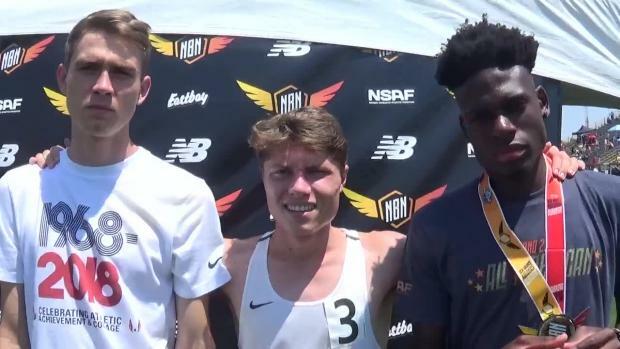 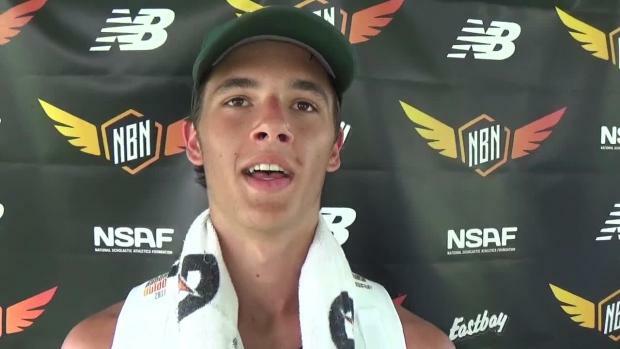 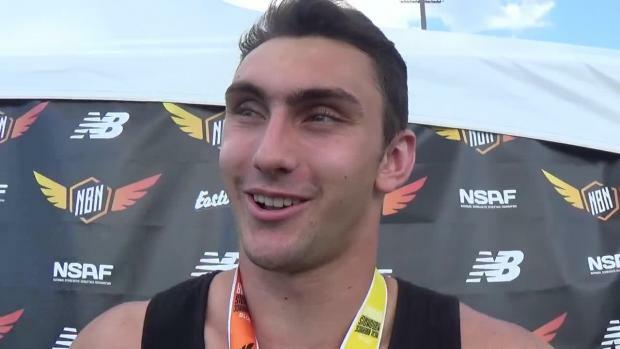 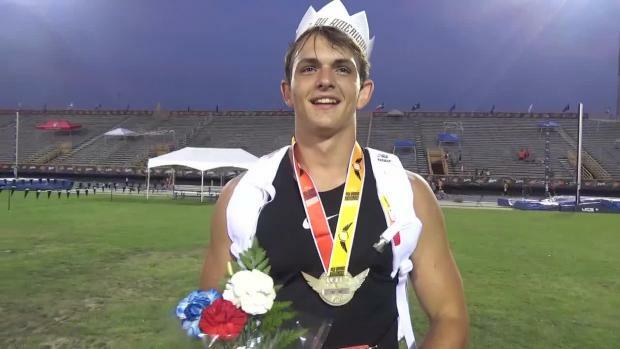 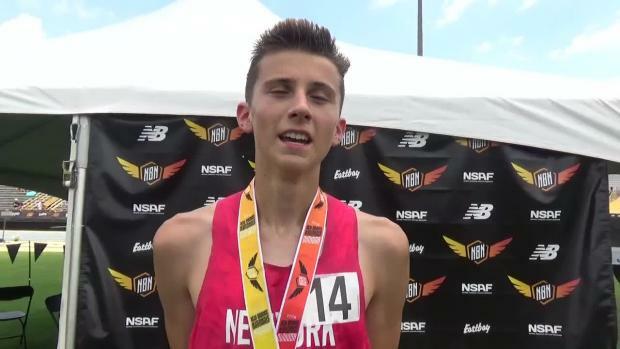 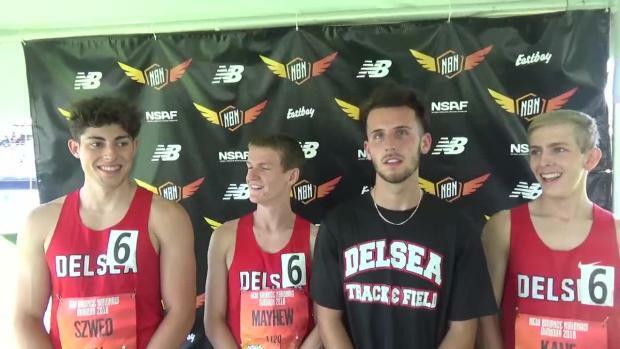 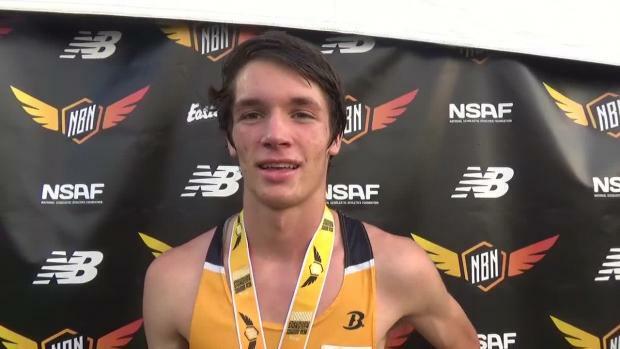 On Sunday Sean Dolan of Hopewell Valley took home the New Balance Nationals Outdoor boys mile championship when he ran a time of 4:12.22. 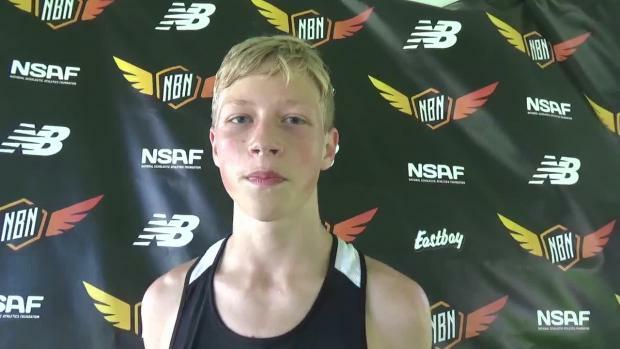 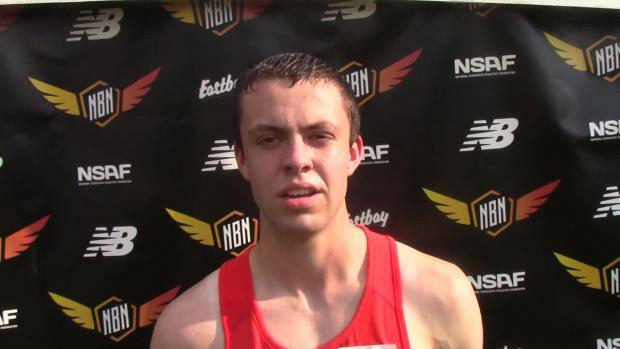 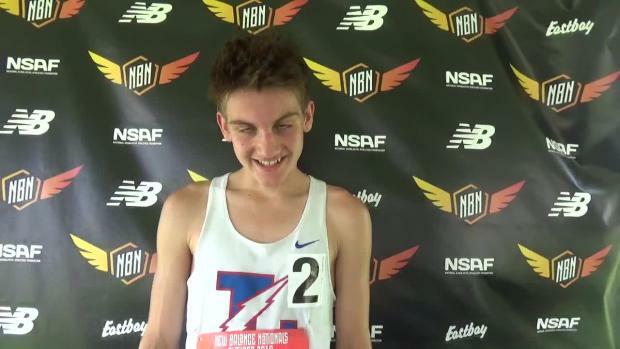 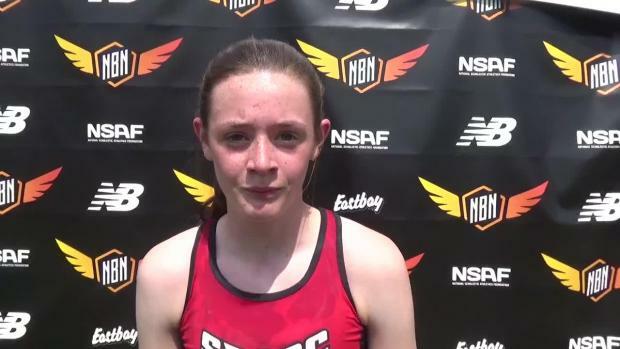 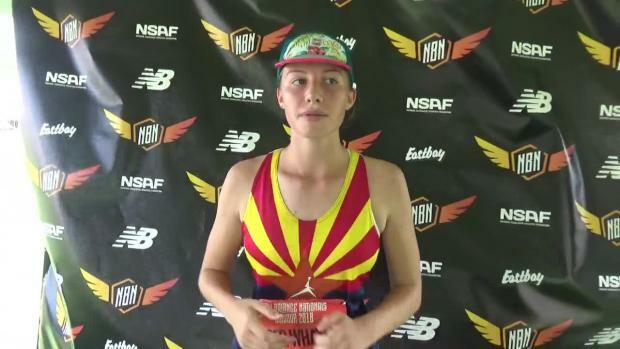 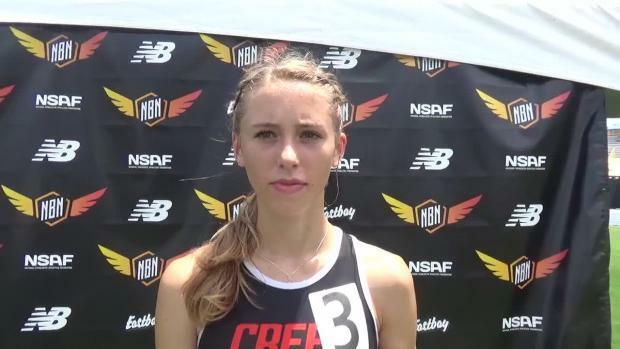 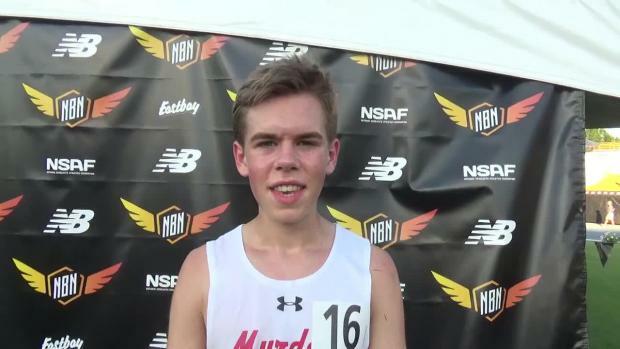 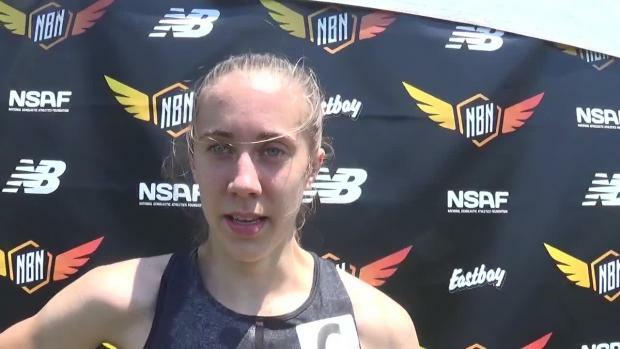 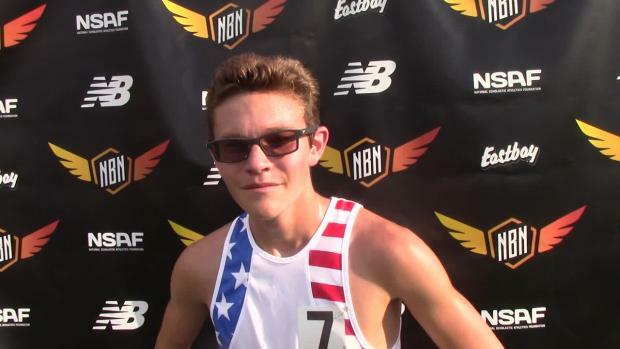 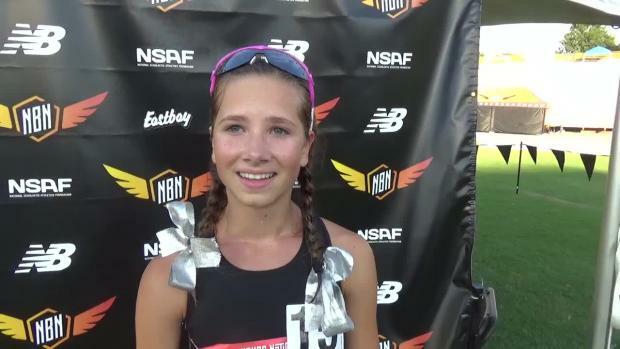 Turpin's Sam Bush will compete in the 2 Mile race at New Balance Nationals Outdoor. 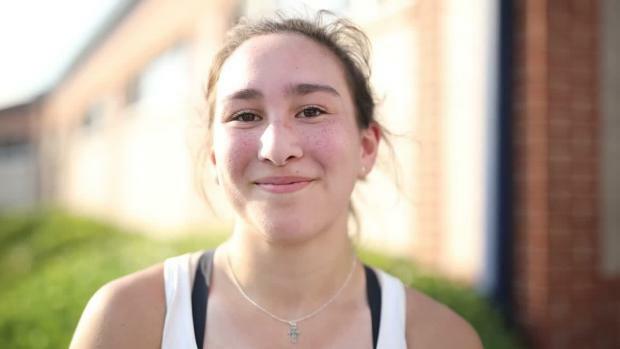 Stafford (now senior) star Gennifer Hirata saved the best for last. 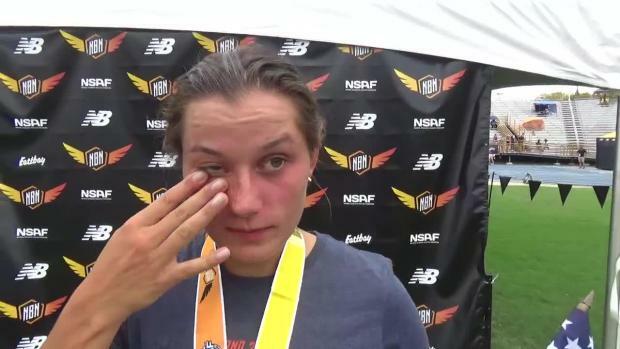 This past weekend in Greensboro, in less than ideal conditions, vaulted her way to a national runners-up finish and to VA #2 all-time. 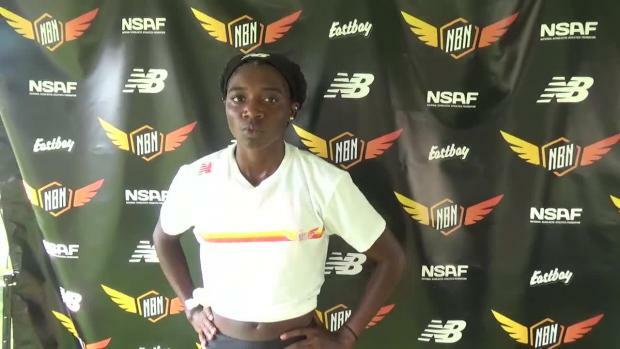 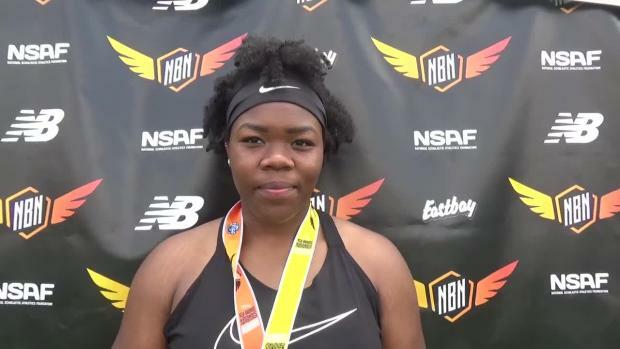 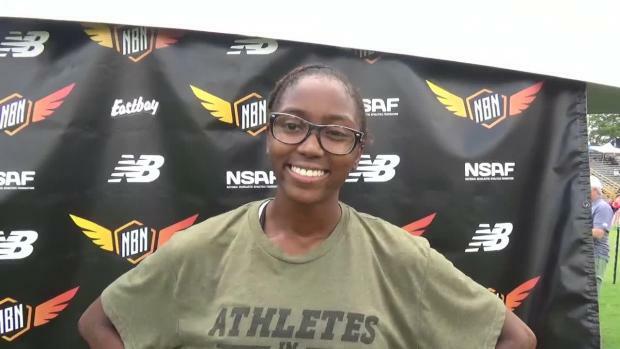 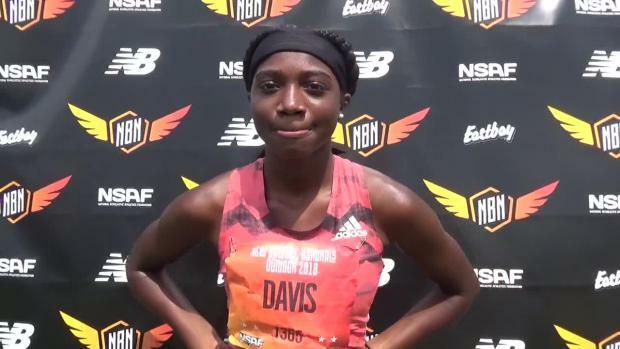 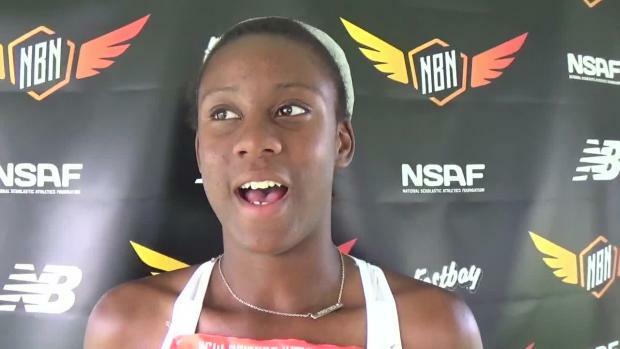 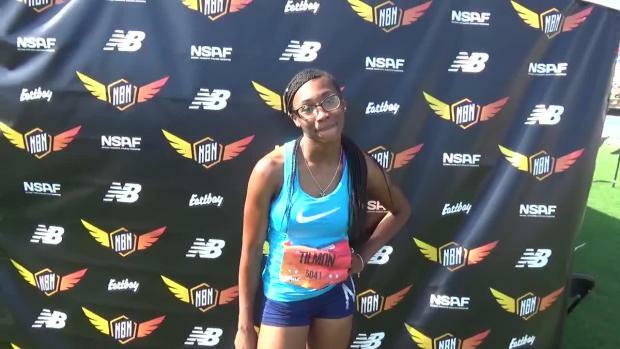 Gainesville freshman Tamari Davis set a new NBNO meet record in the 100m dash with a time of 11.19s. 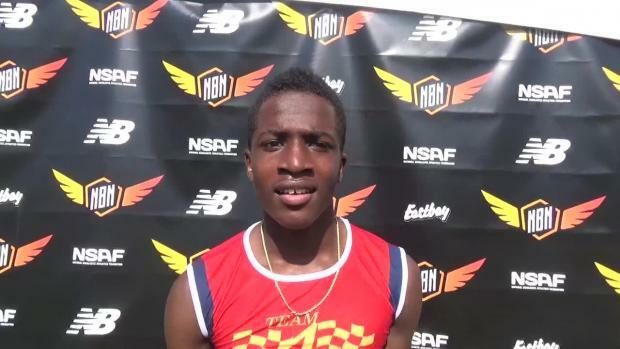 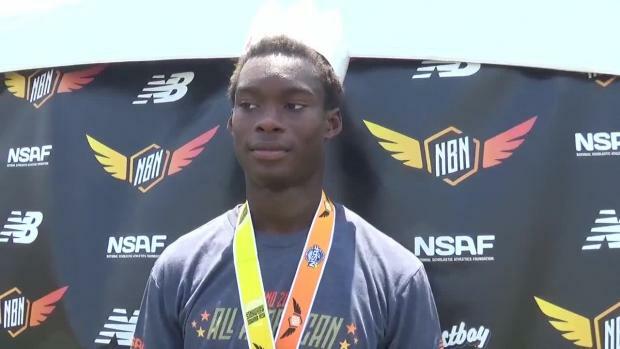 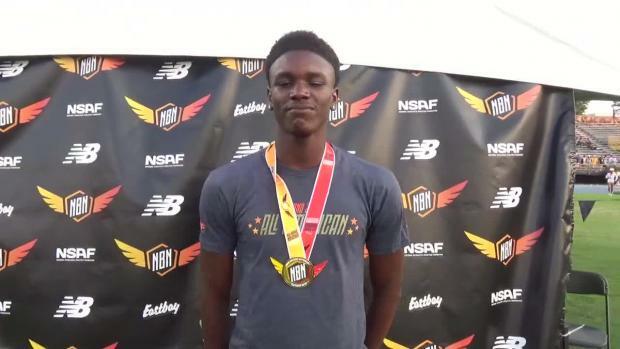 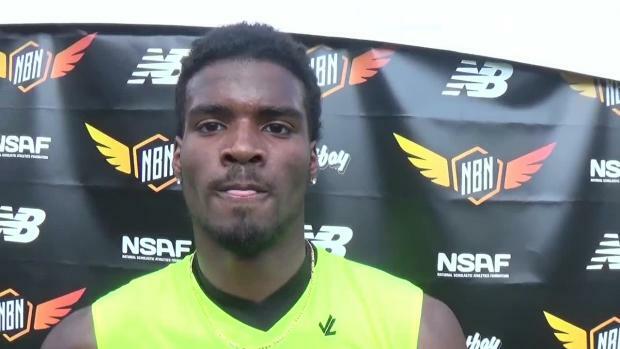 Charles McBride won the National Championship in the Boys High Jump at NBON! 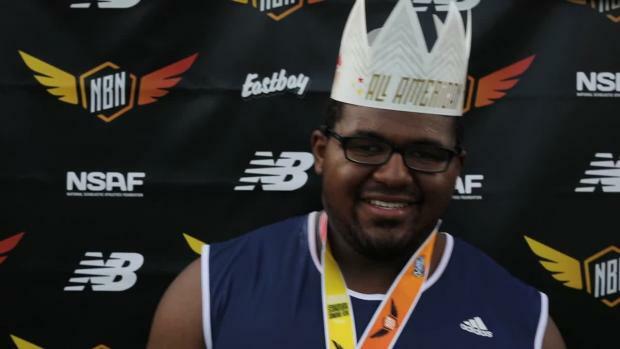 Grassfield's Coach James Nixon is the 2018 Outdoor T&F Coach of The Year. 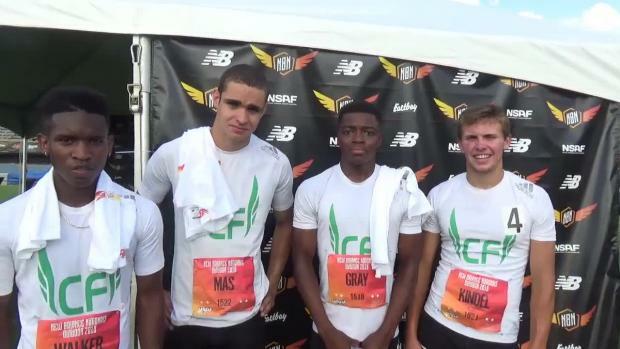 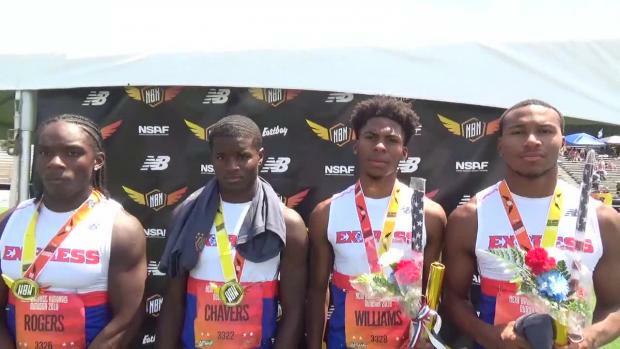 Reagan boys dominate the 4x200m finals clocking 1:25.93 to win the National Championship! 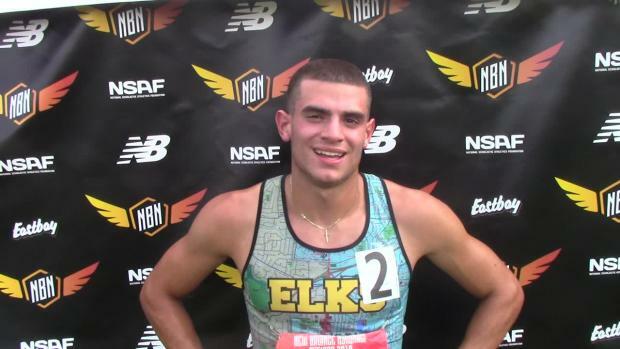 The rising senior opted out of the 200m final to focus solely on the quarter mile. 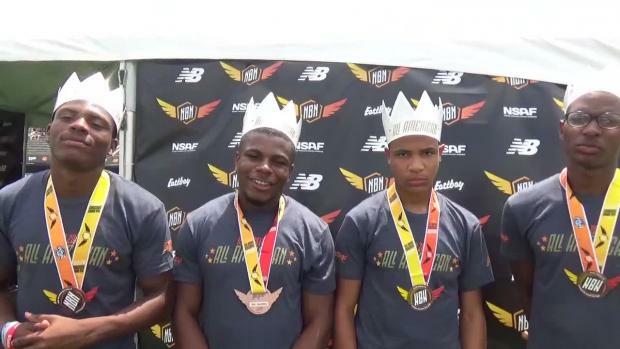 More than 40 athletes and relay teams will be competing in the Championship events at this weekend's meets, which will be held from Friday to Sunday. 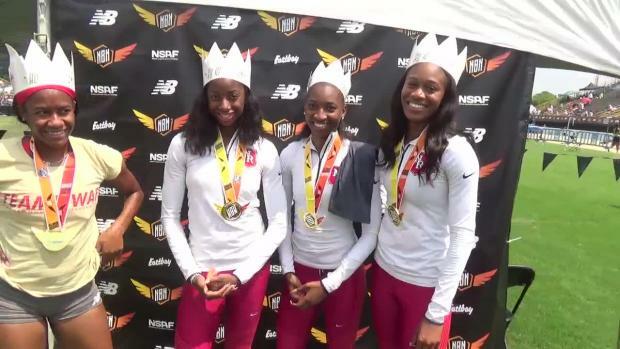 Though Virginia will have chances here and there for national titles, the biggest chance we have is in the relays. 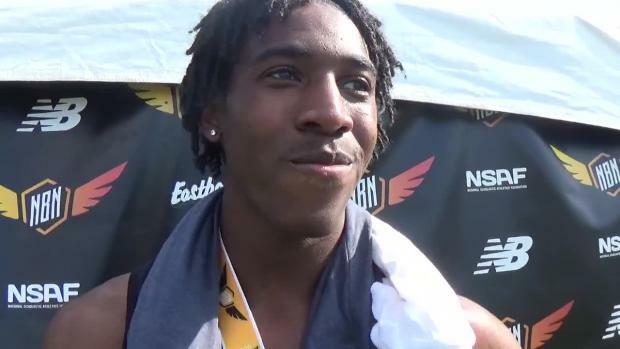 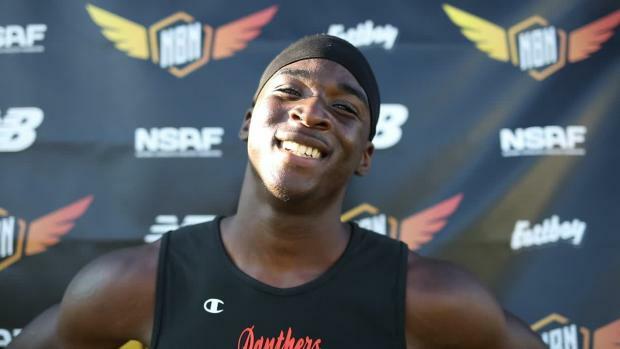 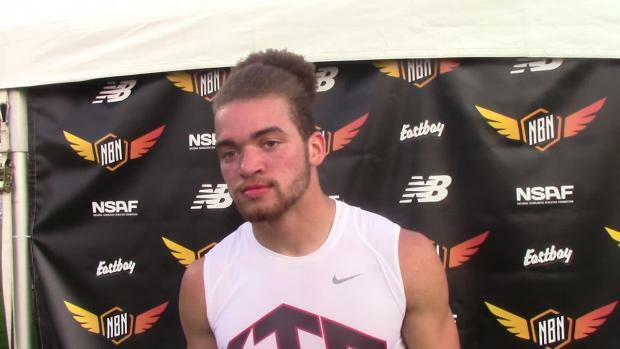 Kurt Powdar was on a mission, he didn't want to make it even close and this afternoon that is exactly what he did to win the Boys 110mH national title. 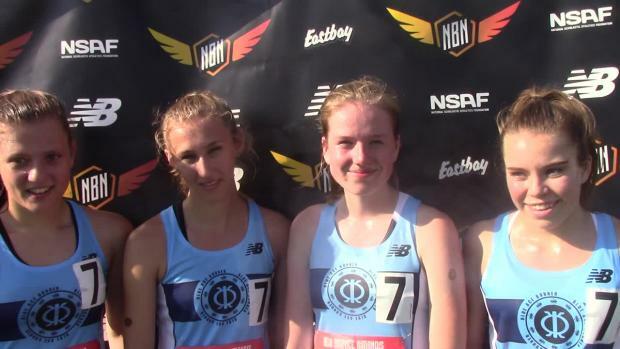 How has Pennsylvania performed at NBNO over the last ten years? 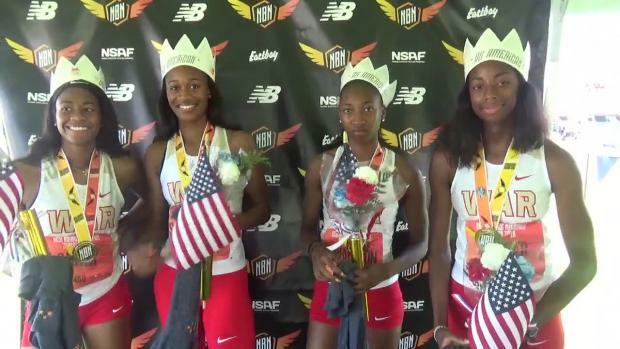 This time they won the 800m SMR (1-1-2-4) National Title. 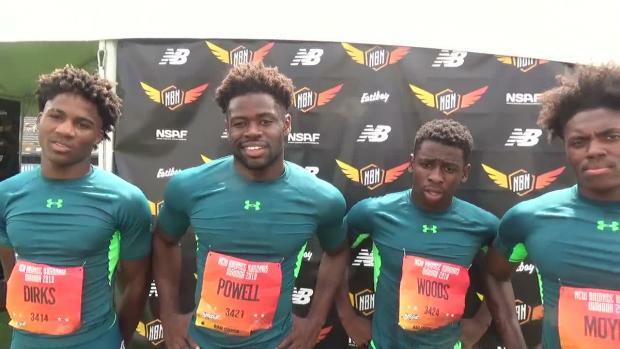 Their time of 1:42.53 is one of the fastest ever run in high school. 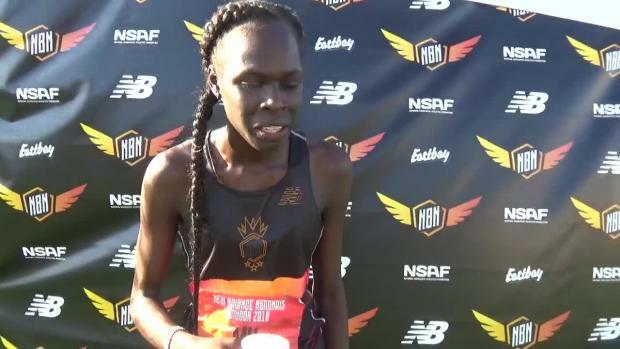 NBNO breakdown of Texas entries. 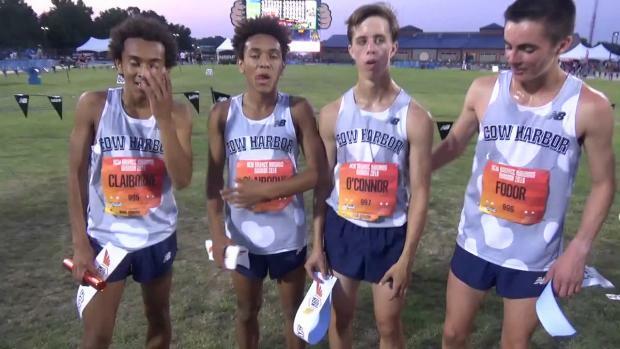 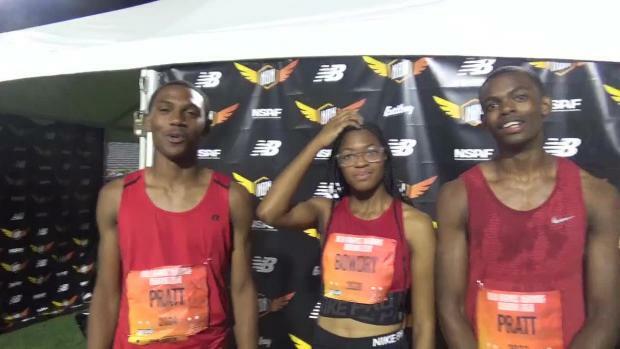 Team VA, more specifically Team 757, showed the nation was boss last night in the Mixed 4x4. 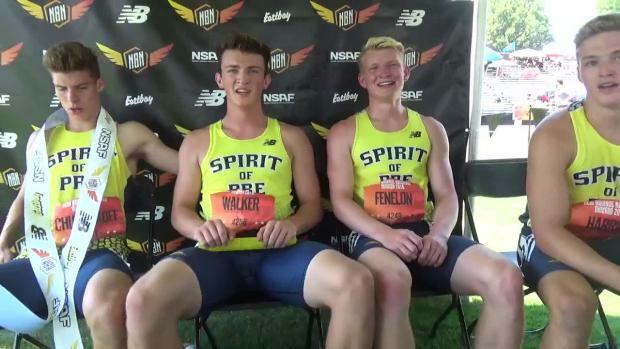 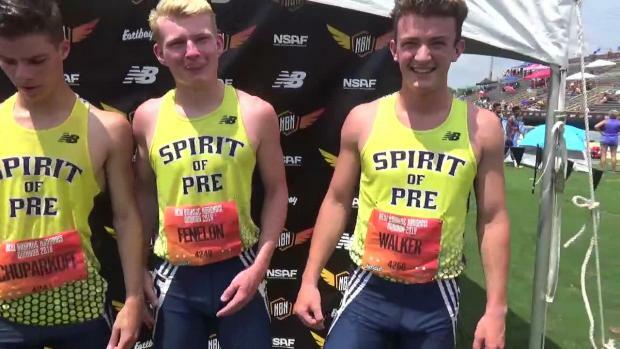 Instead of calling it quits, the Springers got back on the track and sprang back for the New Balance Outdoor Nationals. 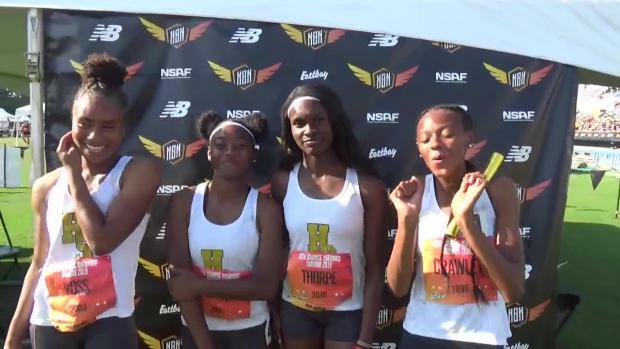 Whom are some of our best tenth-graders? 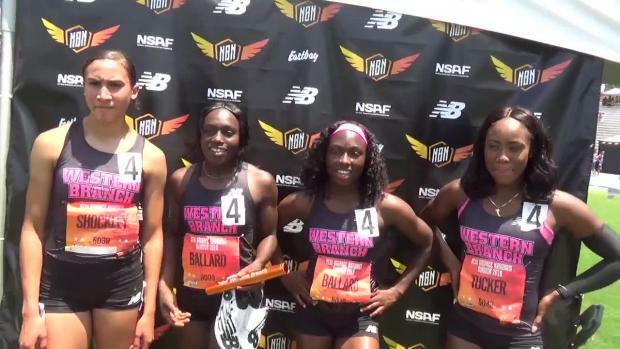 We have it here! 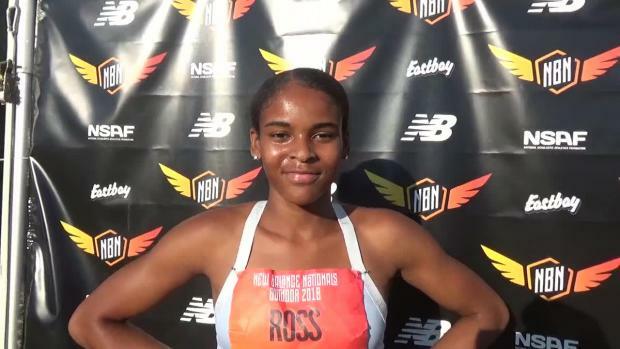 More than 40 athletes and relay teams are entered in the Championship events at this weekend's meet, and a multitude more in the Emerging Elite and Freshmen events. 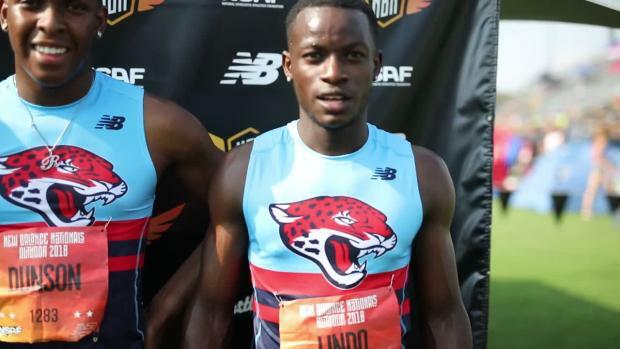 The meet will be held from Friday to Sunday. 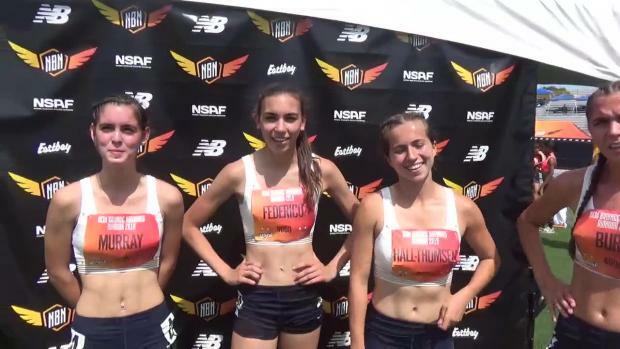 Who are some of our best tenth-graders? 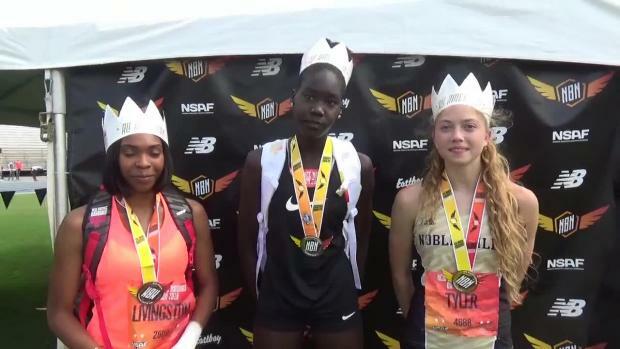 We have it here! 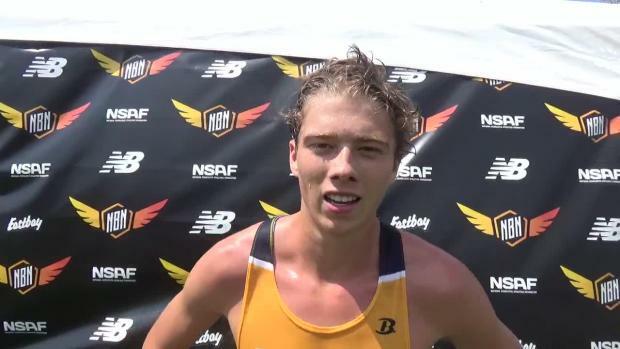 Saline's Anthony Dekraker claimed second place in the Championship 1 Mile race due to his time of 4:13.40. 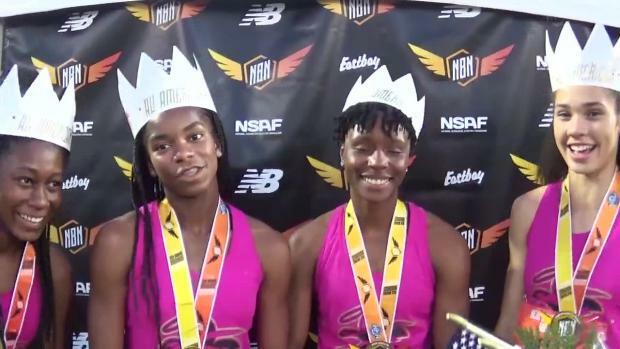 Sisters Shadajah Ballard and Na'Taja Ballard had quite the weekend. 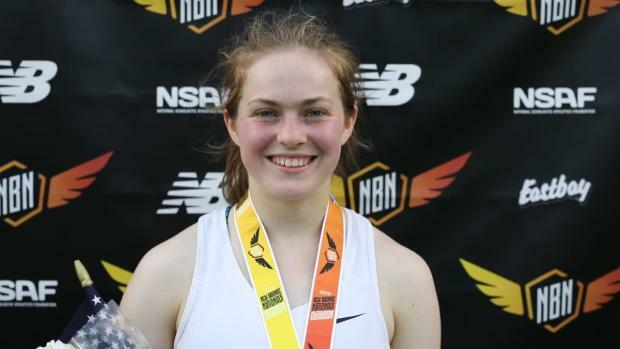 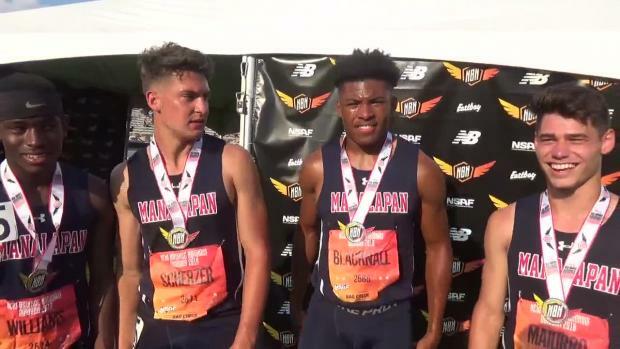 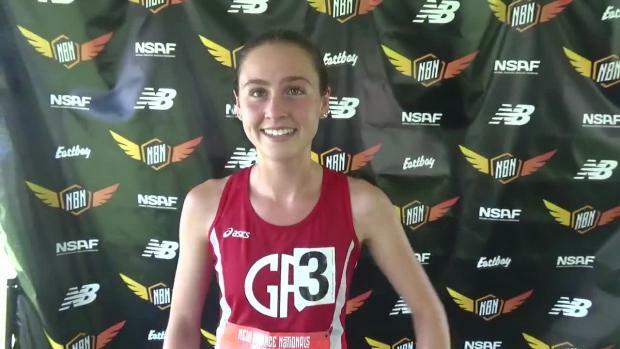 The New Balance Nationals put an appropriate close to what has been a spectacular season for MA athletes. 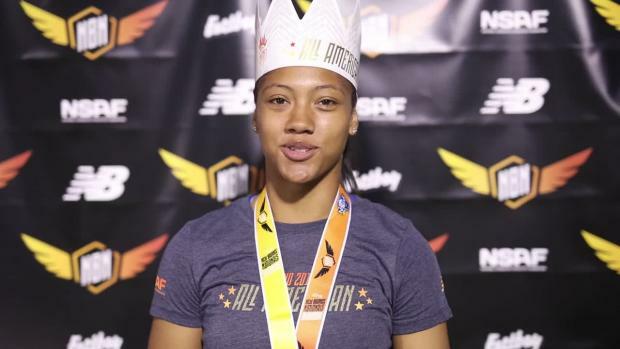 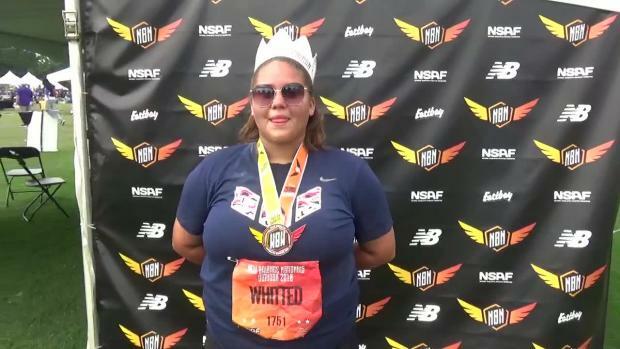 We take a look at the best girls and boys field event performance from New Balance Nationals Outdoor over the last decade. 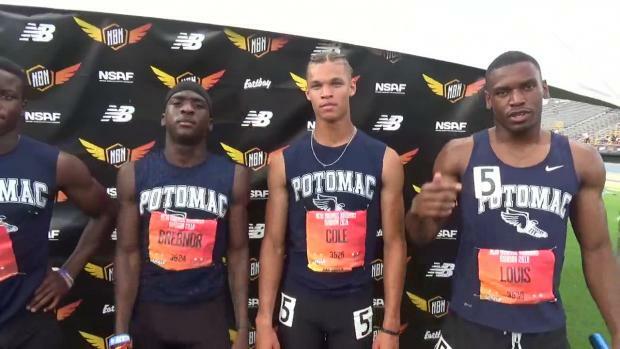 They ultimately crossed the line in 44.92. 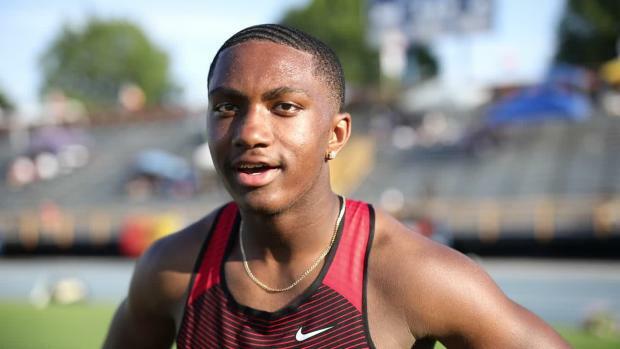 That time is a Virginia state record and US #9 all-time. 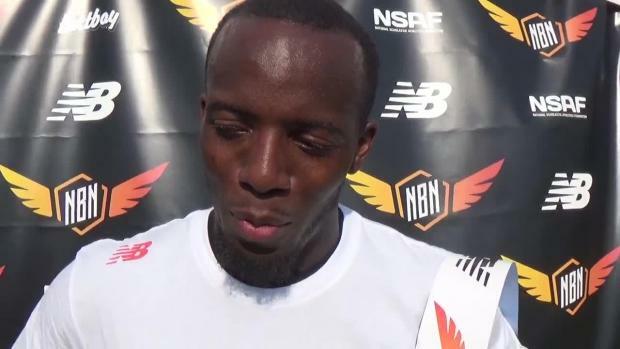 Washington-Lee graduate Jabari Bennett made the most of his one year in Virginia. 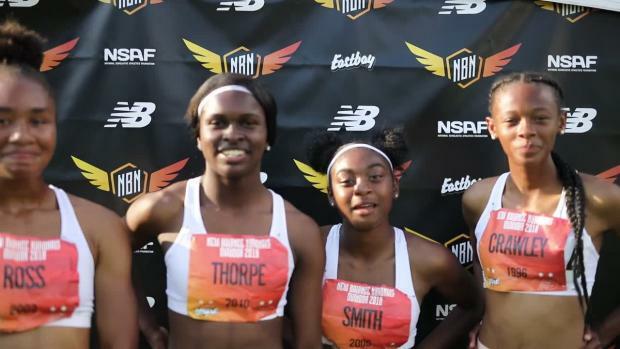 Check out the CA entires by event for this weekend's New Balance Nationals Outdoor at Greensboro, NC. 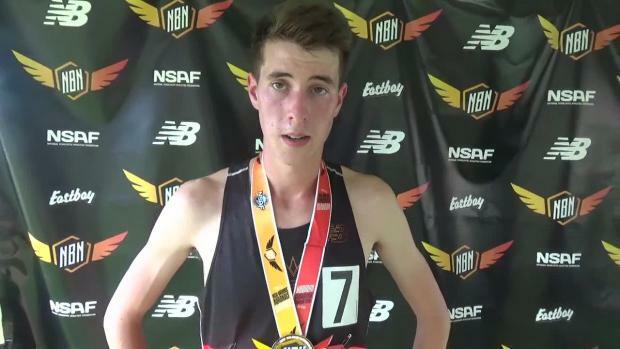 Kieran McDermott, one of the nation's top milers and 800 meter runners preps for New Balance Nationals with his 4x800 meter relay in a workout. 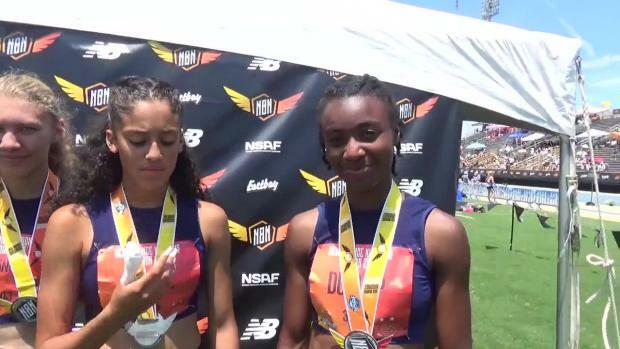 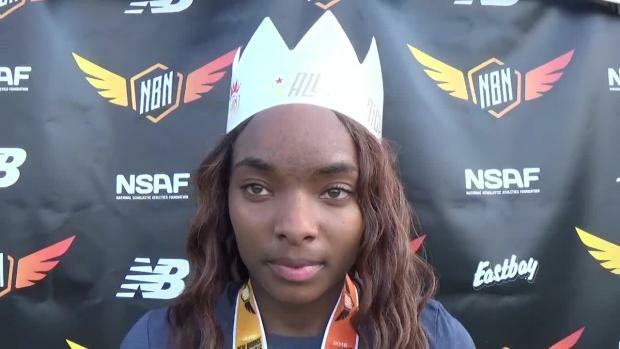 Check out live results from New Balance Nationals Outdoor as they are posted! 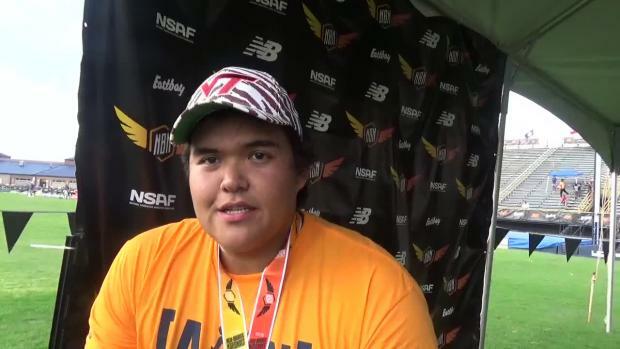 Jaret Prete finished second in the Emerging Elite Division's hammer throw event due to this throw of 179-4. 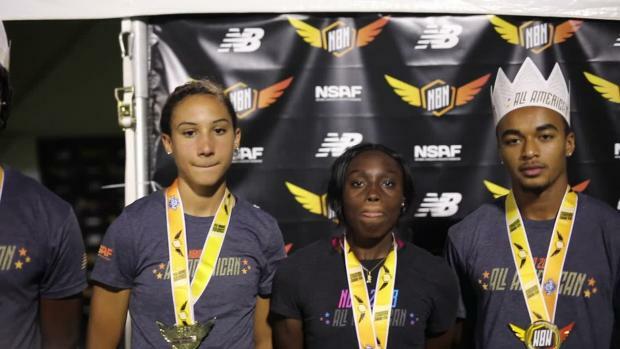 Check out all the photos from New Balance Nationals right here. 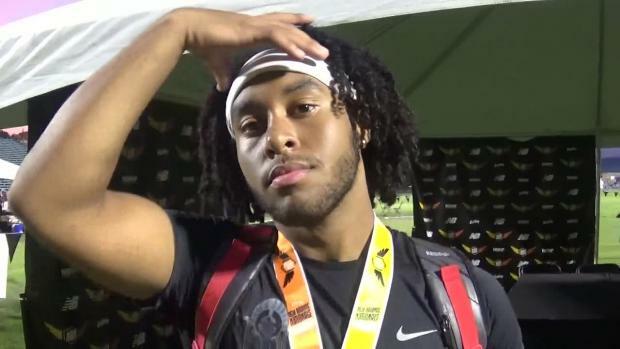 Ohio's Yariel Soto is one of the top contenders in the men's decathlon competition. 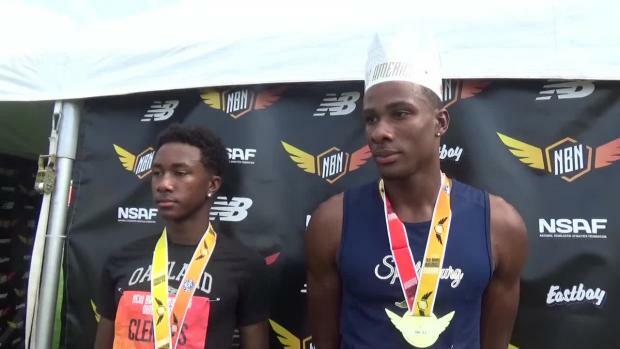 Check out this and other galleries from New Balance Nationals right here. 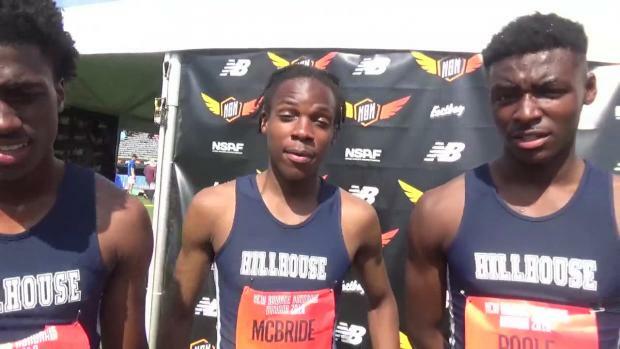 Day 3 New Balance Outdoor Photos by Jeff Sides! 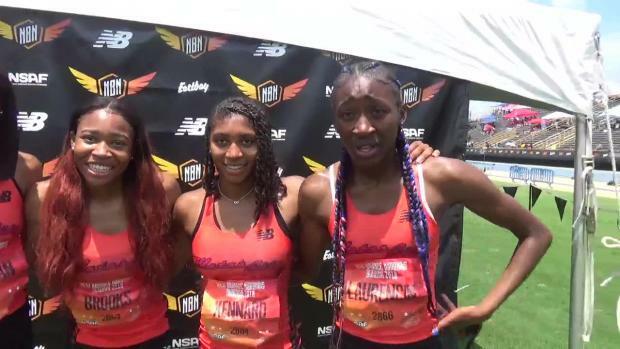 The Saints quartet of Sydni Townsend, Mykala Perry, Dasia Wilson, and Kami Joi Hickson talked with MileSplit after its 4x8 win at NBNO!